One tradition I do want to establish is a New Year's meal. One recipe I've been holding onto for over 5 years is Hoppin' John. I had never heard about it before until I saw the recipe in The Week, one of my favorite magazines (it's like NPR in print) and I misplaced it but, I came across another version of the recipe in Hallmark Magazine in 2007 and saved it in my tearsheet binder. I like this version because it's heavy on pot likker and others I've read look more like a side dish. For those of you who don't know, pot likker is the amazing, flavorful liquid left after many soul food dishes including greens. It's best sopped up with cornbread. Yum yum! 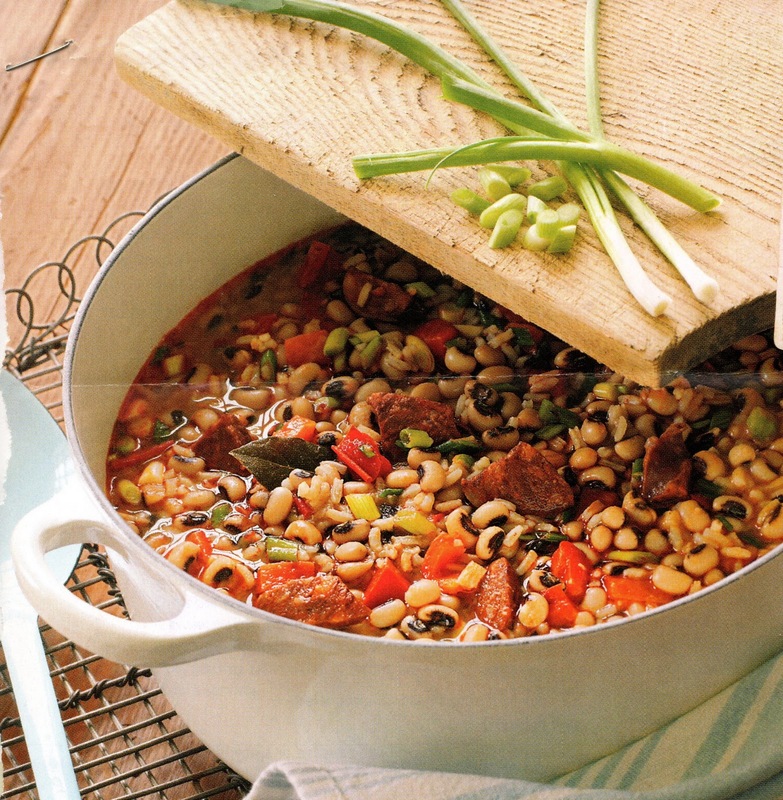 Hoppin John has black eyed peas which is a trademark of good luck for the new year and chorizo, which is one of my favorite sausages. My dad makes Portugese kale soup with chorizo, and I can never get enough of it. 1. Soak the black-eyed peas overnight in water to cover by 2". Drain well. 2. 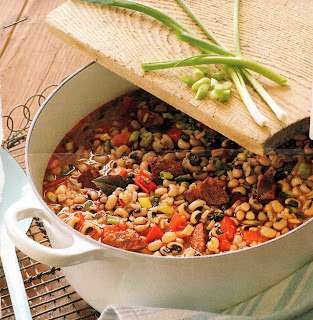 In a large pot, combine the drained black-eyed peas, ham hock, bay leaves, garlic and water. Bring to a boil, reduce to a high simmer, partially cover and cook until the peas are almost tender, about 45 minutes. 3. Meanwhile, price the chorizos in several places with the tines of a fork. Fill a medium skillet with abouot 1/8" of water. add the sausages andbring to a boil over medium-high heat. Cook the chorizos until cooked through, about 10 minutes. Set them aside and discard the cooking juices. When cool enough to handle, cut the sausages into 1/2" dice. 4. Add the chorizos, rice and salt to the pot, re-cover and cook until the rice is tender, about 20 minutes. Stir in the scallions and bell pepper about 10 minutes before the rice is done. If desired, pull off any meat from the ham hocks and add to the pot. Discard the bay leaves. I'll post an update when I make it, but if any of our readers have made it before do you have your own variation? I'm making Hoppin John too! I've never had it with Chorizo though, it was always as a side to oxtails! We (well, I'VE never done it before, it was always my mom) cook it the same way! @Christina ha ha! 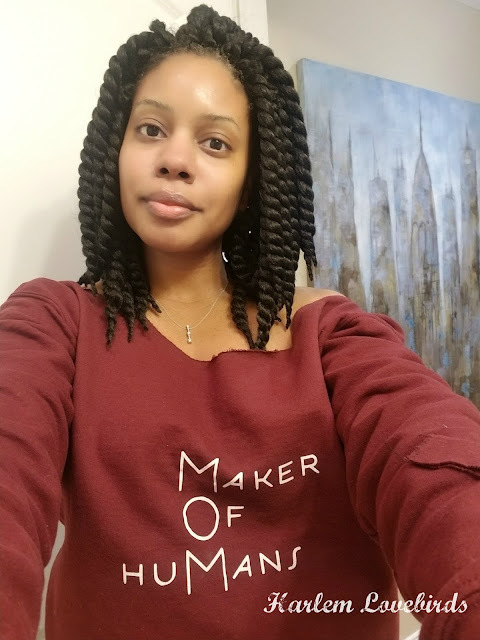 great minds think alike ;-) btw, DH and his family love oxtails so your version has me thinking maybe i should switch it up. . .